World wind speeds have slowed down over the last few decades ------- I wonder why? I believe that the 59.75-year lunar tidal cycle associated with the most extreme Perigean New/Full moons is responsible for the ~ 60-year cycle seen in the Walker Circulation's influence upon the equatorial/tropical trade-winds and the ~ 60 year cycle in the All India Summer Monsoon Rainfall. The lower part of this graph is a reproduction of a figure that I created in 2008. 1. In the lower graph, increased trade wind strength in the Cariaco Basin of Venezuela produces a greater concentration of G.Bulloides in the basin sediments i.e. increased trade wind strength is up in this diagram. 2. 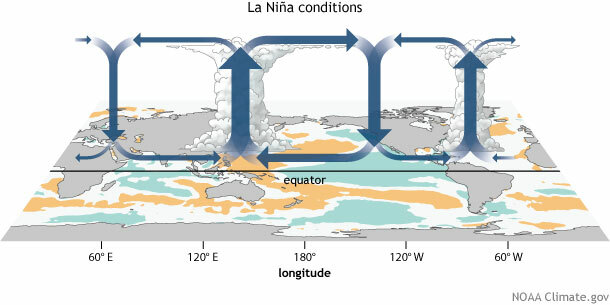 The strength of the trade winds in the equatorial Atlantic Ocean is inversely correlated with the trade wind strength in the central and western Pacific Oceans – because of the Walker circulation. reports that a warming of the equatorial Atlantic Ocean since 1990’s has led to drop in atmospheric pressure over the equatorial Atlantic. This pumps air [via the Walker cell between the equatorial Atlantic and the eastern Pacific Ocean] into the eastern Pacific, leading to a strengthening of the trade winds across the equatorial Pacific. The stronger trade winds lead to greater upwelling of cold water in the eastern equatorial Pacific, which reinforces the atmospheric pressure (and seas surface temperature) difference between the equatorial parts of two oceans. 4. The intensified Walker cell bridging the two oceans produces increasing pressure over the eastern Pacific which attenuates the trade winds that are blowing towards the west off the coast of Venezuela. This means that the trade wind strength in the Cariaco Basin of Venezuela vary 180 degrees out of phase with the strength of the trade winds in the central and western equatorial Pacific oceans. You can see this in the lower graph in the above post. From the late 1980’s onward, there is a rapid drop in the trade wind strength in the Cariaco Basin which is matched by a rapid increase in the trade wind strength in the western equatorial Pacific. N.B. This means that the All India Summer Monsoon rainfall peaks when the trade winds are strongest in the central to Western Pacific Oceans and weakest in the Cariaco Basin of Venezuela.